Jesus Solorio's stubbornness serves him well. Instead of winding up a victim of the surging income inequality in Silicon Valley, he has become a tireless labor activist, refusing to let go of the American Dream. "I like being a champion of raising the minimum wage,” said Solorio in Spanish. “I like being around other people, helping them so they can have better salaries and live a better life." Solorio, 30, is a janitor at San Jose-based eBay. He left Mexico when he was a teenager and he’s now a single father, raising his 7-year-old daughter in a hard-scrabble neighborhood 13 miles from the sparkling eBay campus. 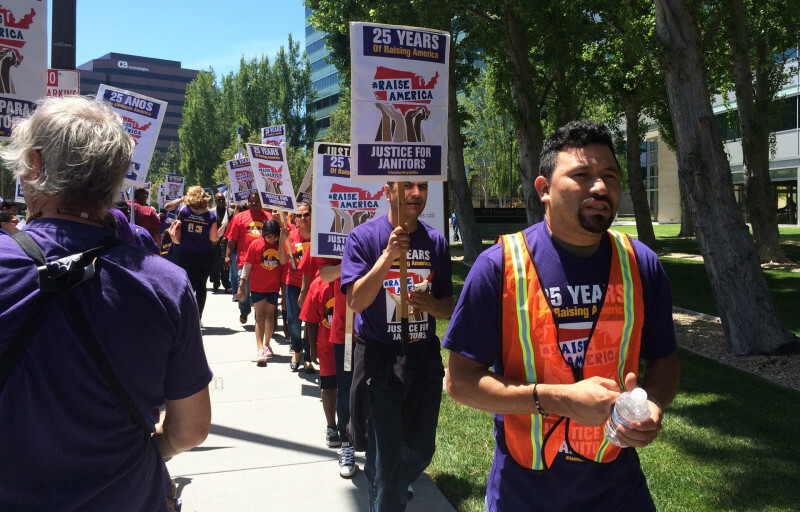 In February, Solorio threw himself into a new labor movement called Silicon Valley Rising, joining hundreds of other janitors, cooks, maintenance workers, receptionists and security guards. These service workers are taking on the high-tech companies they work for, challenging them to pay a living wage. The income gap between the highest-earning 20 percent of households in the Bay Area and the lowest-paid 20 percent has reached $263,000 -- a new record. The new labor campaign is largely powered by immigrants, and a substantial number of those, including Solorio, are at the bottom of the wage scale. 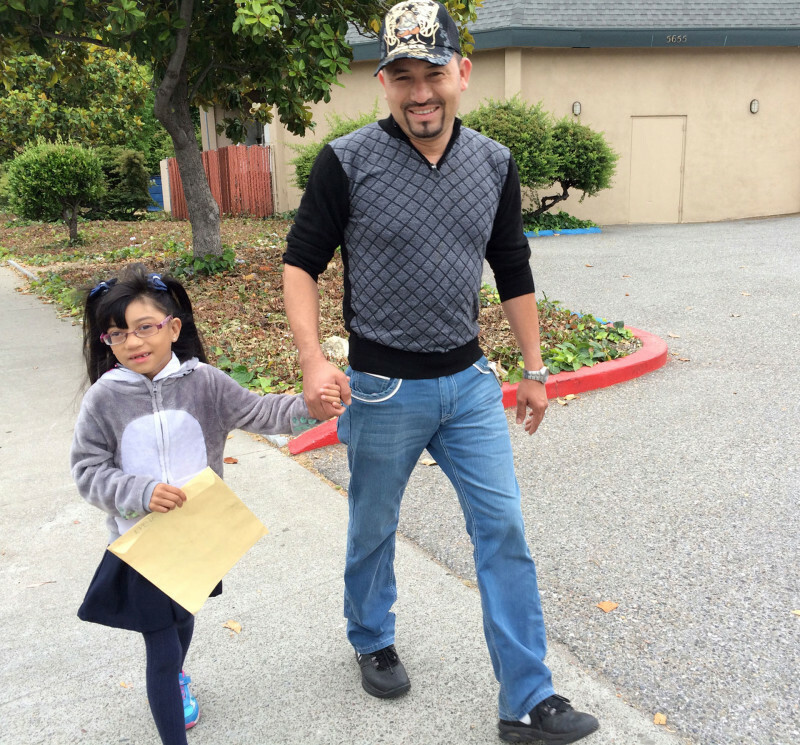 On a recent morning, Solorio walked his daughter, Evelyn, to her San Jose elementary school, where she qualifies for reduced priced lunches. Along the way, he talked about how difficult it is to make ends meet on his modest paycheck. Solorio feels lucky to belong to a union, SEIU USWW. Under the terms of his contract, he makes $15.50 an hour plus benefits. That's better than most Silicon Valley service workers who are not unionized and make $12 an hour, on average. But money is still terribly tight. "If it’s just one person, it isn't so bad," Solorio said. "But when you have family and other people to care for, it becomes really difficult." The cost of housing in Silicon Valley is among the highest in the country, according to the U.S. Census Bureau. The 2015 Silicon Valley Index shows rental rates rose 11 percent (to $2,333 per month). The median home price is $360,000 higher than the rest of the state. And that makes the wage gap even tougher. Solorio and his daughter share a tiny two-bedroom apartment with his brother’s family of four. It’s the only way they can afford the $1,500-a-month rent. Early mornings are tough after working the swing shift, but Solorio shakes off sleep each day to walk or drive Evelyn to school. This is clearly their time to connect. Holding her dad's hand on the 20-minute trek, Evelyn trots along in her blinking sneakers depicting Princess Ana from the movie "Frozen." This day she tells her dad what she wants for her seventh birthday party. "We're going to take a trip to Chuck E. Cheese," said Evelyn in Spanish. The pair stops at a doughnut shop along the way for a $1 breakfast treat. Solorio says his daughter keeps him going. He will do anything to make her life better. Like Solorio, almost half of Silicon Valley's workforce comes from another country – 46 percent, according to Joint Venture Silicon Valley, a consortium of business and civic leaders. Some immigrants have started successful tech companies and are in the highest income bracket. But a large percentage is at the bottom of the wage scale. "They make this economy hum and their wages have been stagnant,” said Russell Hancock, president of Joint Venture Silicon Valley. “There's been no growth in their wages over a period of decades." Why are their wages stuck, given Silicon Valley's prosperous economy? Solorio -- like many service workers at tech campuses -- is actually employed by companies contracted by the big-name tech firms. Those contractors are competing with each other. Field, the head of the South Bay Labor Council, said that's a recipe for exploitation. "High-tech companies are using contractors who are often low-road operators,” said Field. “They don't pay their employees well and they don't provide benefits." Solorio's employer, the janitorial contractor GCA Services Group, did not return phone calls to its offices in Ohio and Alviso. A spokesman for eBay said his company did not want to comment on the growing wage disparities. Activists with Silicon Valley Rising have been demonstrating outside the offices of contractors as well as at the big tech companies. They are working to unionize service workers. And the movement -- a coalition of labor unions, faith groups, immigrant advocates and community-based organizations -- is also pushing for more affordable housing in the region. Silicon Valley Rising was launched at Our Lady of Guadalupe Church in East San Jose's Mayfair neighborhood. Back in the 1950s, much of the area was known as Sal Si Puedes, or “Get out if you can.” It’s the same church where Cesar Chavez began his crusade as an activist and farm labor organizer, inspired and encouraged by the parish priest. 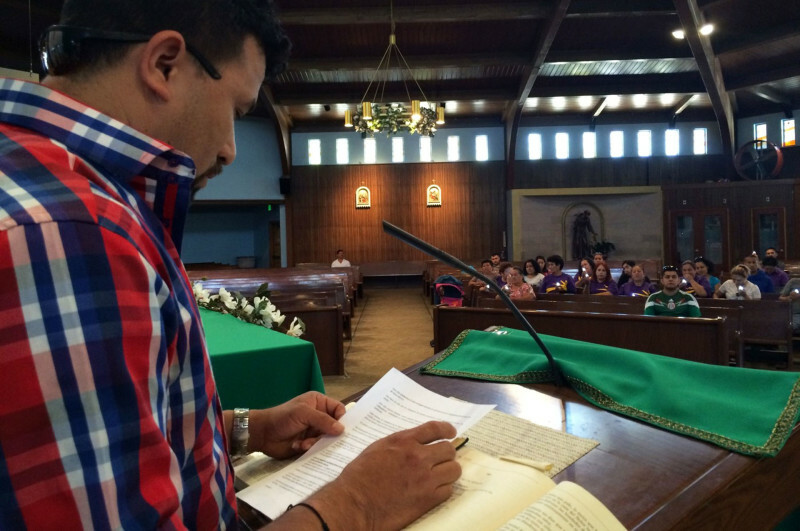 Today the church still serves a primarily Latino immigrant community, with Mass and community services in Spanish. Salvador Bustamante -- once a farmworker himself -- is executive director of Latinos United for a New America and one of the leaders of the new labor movement. He believes Silicon Valley Rising must go beyond old-fashioned labor organizing. "People need to go to the next level,” said Bustamante. “Being a union member is not enough. We also need to participate in the political process." Solorio has taken that on. He is trying to help other service workers unionize. But he is also a stalwart presence at nearly every rally. He has made several trips to Sacramento to protest outside the Capitol for a bill to hold companies accountable if they don’t pay back wages. He wants to improve his own situation and he’s compelled to speak up for other service workers not protected by unions. "There are a lot of people who are scared to get involved because it always happens where they are let go," he said. Solorio says the only way for immigrant workers to win this fight for higher wages and better benefits is to take chances. Right now, he said, there is nowhere to go but up. California has the seventh-largest economy in the world, and immigrants have a long history in building that prosperity. Today one out of every three working people in California is an immigrant — a share that has grown in recent decades. Our state is shaped by these workers and entrepreneurs — 6 million people who’ve found a job in the Golden State. In our series “Immigrant Shift,” KQED and The California Report explore the impact they have, the challenges they face and the policies that affect them.